As a TPI Level 3 Fitness Instructor and long time personal trainer and yoga instructor, I have witnessed firsthand the incredible fitness benefits that yoga provides for golfers of all levels. Golf conditioning yoga is one of the easiest ways to restore, improve, and maintain optimal functional movement patterns and maximize golf performance. Why? Because yoga or yoga asana (yoga for exercise) is ultimately about proper breathing patterns, and high levels of stability, internal strength, muscle endurance, and balance. Most yoga teachers and students mistakenly regard flexibility as the paramount goal of yoga. This is incorrect. When yoga conditioning for golf is practiced in a proper progression protocol, it creates natural improvements in functional flexibility. Functional Flexibility is a combination of Mobility - ROM (range of motion) around a joint site, and Flexibility - Muscle Elasticity or Tensile Resilience of muscles or muscle groups being dynamically challenged to lengthen. I use the term functional flexibility because this is not about getting your leg behind your head. Yoga is not about extreme flexibility. In fact, that can be detrimental. I think this is one of the reasons so many male golfers avoid yoga/flexibility work. Lets take a look at how a golf conditioning yoga program can improve each component of fitness. Here are some of the generally agreed-upon or accepted ways to measure fitness in an individual. Golfers need all of these to perform at an optimal level. I will explain how yoga improves and increases all these various parameters of fitness. be measured by a certain number of reps for that particular exercise. For golfers, generally an 8 reps maximum is used. Yoga poses require a high level of muscular strength. Many yoga poses utilize the weight of the body against gravity to exert force. This produces higher levels of muscular strength. Golfers need above average amounts of muscular strength to achieve a powerful golf swing. Muscular Endurance is the ability to hold an isometric position (i.e. a wall squat) or to perform a certain number of repetitions of a certain exercise. Isometric refers to muscular effort involving stationary muscle endurance; in other words, effort without dynamic movement. The ability to hold isometric muscular contractions while performing a yoga pose for an extended time frame (30 secs. to several minutes) increases muscular endurance. Muscular endurance is very important for golfers. It gives golfers the ability to perform at a high level for a sustained period of time, such as in a round, tournament, season, career, or lifetime. Functional Flexibility/Mobility is the ability to move muscles and joints at different angles and ranges of motion (ROM) specific to the task or athletic movement at hand. In this instance, the athletic movement is the golf swing. Flexibility refers to the tensile elasticity of the muscles, mobility to the ROM at the joint sites. Yoga poses provide a vast array of shapes that both strengthen and stretch the body at many different angles in all ranges of motion. a regular yoga practice will increase functional flexibility and therefore naturally improve mobility. This may be the most important fitness component for a golfer to enhance and maintain. Speed in golf is determined by the ability to accelerate in a controlled fashion. Flexible muscles move faster and help enhance mobility in the joints. Increases in clubhead speed and better accuracy are easily achieved when a golfer has higher levels of functional flexibility/mobility. Balance is the ability to sustain our center of gravity when external forces are placed upon it. In sports, an opponent could throw you out of balance. In golf, the wind or an awkward, uneven lie can significantly challenge balance. Balance is also our ability to maintain grounding energy and our center of gravity while moving (golf, tennis, etc.). 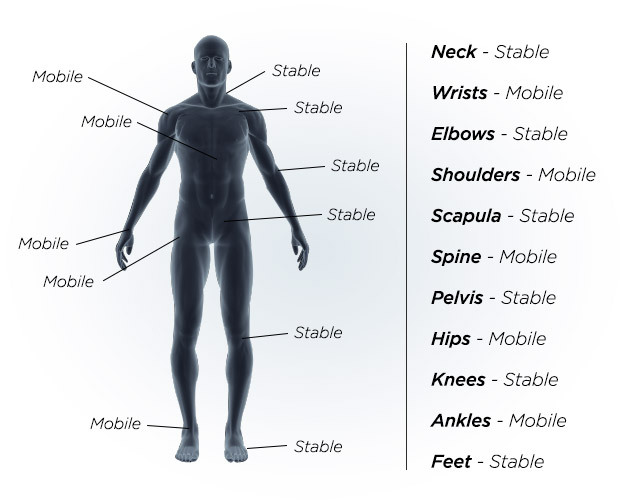 Stability is the ability to sustain balance in different areas of the body and remain in balance while different body parts are moving, or when external forces are placed upon the body. The speed of the golf swing can take us out of balance if we are not stable. Yoga improves both balance and stability dramatically. Most of the standard standing poses in yoga require a tremendous amount of stability and balance. 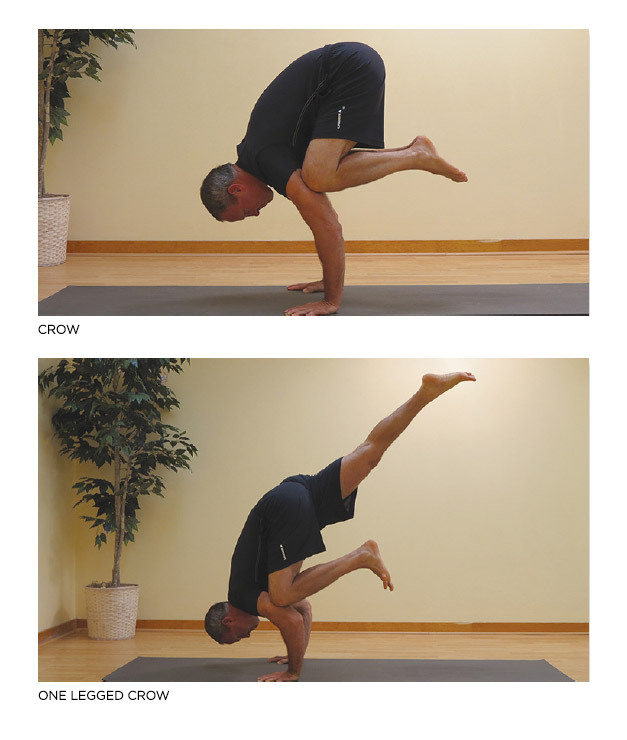 Any of the one-legged balancing poses or arm balancing postures requires even higher levels of balance and stability. Golfers obviously need high levels of balance and stability in order to create and maintain a powerful, reliable golf swing. Regular practice of yoga provides this. Cardiovascular Endurance is the ability to sustain an increased level of aerobic exertion over an extended time frame. Any form of exercise has some effect on this. Yoga works directly on this because deep breathing is the primary focus of the yoga presented in this book. Yoga poses require sustained, powerful levels of isometric muscular contractions. When this is merged with deep and full yogic breathing, it increases the ability to utilize and access more lung tissue, which increases lung capacity. This form of cardiovascular conditioning is actually more refined than aerobic exercise. Traditional cardio or aerobic exercise utilizes increases in heart rate to overload the cardiovascular system. Basic cardio work like a brisk walk is excellent for circulation, but it does not provide the access to the lung tissue that refined yogic breathing will stimulate. Both forms work well and should be used regularly to improve overall fitness. Golfers need above average cardiovascular endurance to achieve peak performance. Body Composition is the ratio of lean tissue (muscle) to fat tissue (adipose) in the body. Yoga poses utilize dynamic isolated active stretching and strength routines that sculpt and shape the body. This changes the internal fabric of connective muscle tissue. Appearance also changes: as the ratio of lean tissue to fat is increased, the body naturally shifts things around. The more fit the golfer, the easier it is to maintain appropriate levels of body fat for their age group and gender. This is not about being skinny, and I don’t get too carried away with this one as a trainer and a yoga teacher. Life and golf are about the ability to function at an optimal level for a long period of time, not an unattainable perfect physical appearance. joint sites, then golf dysfunction of some kind is bound to occur. Yoga is a blend of strength/endurance (stability) and flexibility (mobility), and immediately provides the golfer with higher levels of both of these. Yoga will finely tune your body, and when the body is finely tuned, better golf is easily achievable. If you are a golfer, you are an athlete. If you are an athlete, you need to be fit. There are many ways to get fit. Yoga is an excellent and important part of your fitness regimen for golf. The benefits of yoga and the yoga described in this book will immediately carry over to your golf game and your life. Obviously, the more time and energy spent on the discipline of yoga, the quicker the improvement. All components of your fitness will improve with regular yoga. As to what constitutes “regular” yoga, four or more sessions per week, with adequate rest or off days, is regular yoga. Many people, especially men, think that yoga is all about flexibility. People say “Oh, I’m tight. I can’t do yoga.” That is exactly why they should do yoga! Ultimately, yoga requires strength, endurance, core power, stability, and mobility before it requires flexibility. That is why I use the words Functional Flexibility, which refers to joint mobility as well as muscle elasticity (flexibility). The amount of flexibility we need and have is relative to many factors: skeletal design, space around the joint sites due to skeletal design (especially hips and shoulders), current levels of fitness, exercise history, injuries, and surgeries. Notice I did not mention age. Age can be a factor, but there is so much variability in what people can do at a certain age. Most of the variances are due to the amounts of activity people get at any time period in their lifespan. Besides, the golf ball doesn’t know how old you are. The golf ball knows physics and the laws of dynamic energy. The faster and more efficiently you swing, the straighter and farther the ball flies. Being fit highly increases your chances of playing better golf. just some of the benefits of regular exercise, regular movement, and a more active lifestyle. Obviously, aging has some effect on overall fitness, but it is inactivity that causes the more dramatic decreases in all parameters of fitness and overall health than any other factor. I’ve had people say to me, when looking at a picture of themselves at a younger age, “Look at what happened to me.” Did it really happen to you, or were you just lazy and stopped moving, and that is what caused the dramatic shift? Do something now, right now! Go for a walk, lift some weights, do some yoga, walk the golf course, anything, please! It’s your life, and you can make the changes you need to by exercising on a regular basis. It is way harder to be sick than to exercise. You are never too old, and it is never too late. Michael Brantl is co-owner of Jayani Yoga, Inc. in Pennington, New Jersey. Mike is a TPI Level 3 Certified Fitness Instructor, ACE Certified Personal Trainer, NSCA Certified Strength and Conditioning Coach and a Certified ACSM Health Fitness Specialist. Just did a Yoga for Athletes training and discussed golf formats for flexibility, strength and mind. Excellent couldn't agree more !! I am a golfer and have done regular yoga for years I just live the way you feel in your own skin and how string and empowered yoga makes you feel some people just don't get it !! Will check out the book too. Great stuff Michael! Do you work with a lot of male golfers in their 50's, 60's, & 70's? I am targeting that market in Springfield & Branson, MO and I would like to connect with you on having you as a resource for them - www.SWSGolfAcademy.com. I look forward to getting your book! I played my best golf in AZ doing Yoga and taking Yoga for Golf workshop from Katherine Roberts.